We all have personal favorite newspaper names. 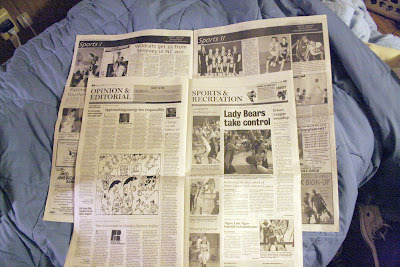 The Canton Repository, the Plain Dealer, the Blade. Now that I think about it, lots of the badass ones happen to be in Ohio. No matter. 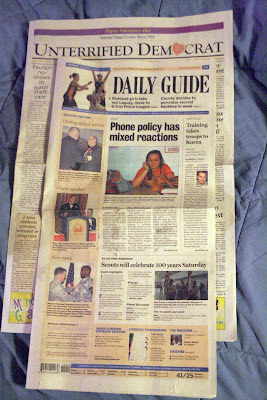 Because I have in my hot little hands what happens to be hands-down the best newspaper name in the world. And it's right here in little old rural Mizzou-rah. That's right. The Unterrified Democrat. Possibly the most badass newspaper name ever. Unterrified. Democratic. That's all you want. The UTD (my new nickname) is a weekly out of Linn (pop. 1,432) that serves Osage County. If you'll remember, Osage County was one of the counties with a nice-looking historical society website. Unfortunately, the UTD has no website. But a Google image search image search for "Unterrified Democrat" yields this photo, so I assume it gets around. I like narrow papers. I always thought the WSJ was too wide until they reduced it. I found it when I stopped at the gas station in Westphalia along US 63 to drain the pipes. I had to have one. This is great, Jack. I like wide newspapers and magazines. They feel more... substantial. And yes, Ohio has great newspaper names. The Plain Dealer is probably my favorite. Jon's grandmother, who lives with his parents, subscribes to the PD. She always refers to the it as the "real newspaper" in order to differentiate it from the local paper Jon's parents get. In Osage County, we call it the UD and it does have a website. I am also a newspaper fan. I discovered the UD while attending the 2011 MO State SkillsUSA competition as a sponsor. I lost the key to my rental car and had to have the car towed into Jefferson City to have a new key made. A very nice Linn Tech(where the competition was held)instructor drove me and my student into JC. It was late and we stopped for a bite to eat. We had a long conversation about world events and the gentleman brought up the UD. It was about that time that I learned he was the Mayor of Linn. 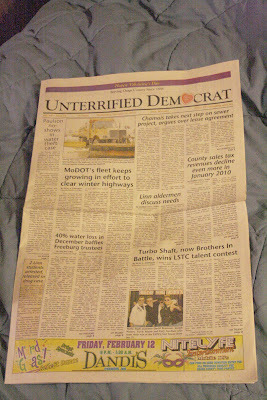 So, I can say that not only does Linn, MO have a great newspaper but a great Mayor as well! !